Best known for its bright, retro fridges, the Italian appliance brand has employed some big-name designers. Although it is often associated with a rather Scandinavian aesthetic, domestic appliance manufacturer Smeg is an Italian company. This year, it is celebrating its 65th anniversary, having been founded in 1948 by Vittorio Bertazzoni, from Guastalla, a town near Reggio Emilia in northern Italy. The Bertazzoni family's involvement in blacksmithing dated back to the 17th century. They later branched out into enamelling, a process that makes metal more durable and easy to clean. Bertazzoni cookers were on show at the World Expo, held in Milan, in 1906. Established by Vittorio as an enamelling plant, the Smeg name is an acronym of Smalterie Metallurgiche Emiliane Guastalla, celebrating its initial activity and location. The post-war era ushered in a growing demand for domestic appliances, as lifestyles changed and such products became status symbols. Smeg entered this market with a plethora of technically innovative products. In the late 1950s, it launched one of the earliest gas cookers, featuring an automatic starter, oven safety valve and timer. In 1963, it introduced its first dishwasher and laundry range. The mid-70s brought the arrival of Europe's first built-in hobs and ovens. Stylish industrial design is one of the brand's cornerstones. It has worked with world-renowned architects and product designers, including the man behind the London Shard, Renzo Piano (who has designed fridges, ovens and hobs for the company); Italian architect Guido Canali, and Australian designer Marc Newson. Every product is manufactured entirely in Italy at one of three factories. Surprisingly, the product for which Smeg is best known – its brightly coloured, retro FAB fridge – was not introduced until 1996. Since then, it has become a must-have appliance for any kitchen seeking to achieve urban chic. As well as a range of colours, it is also available in quirky designs, such as national flags, and there is even a denim-covered version. Recently, the fridge's prominence in the BBC series 'The Great British Bake Off' led to a rap across the knuckles of producers for contravening editorial guidelines. 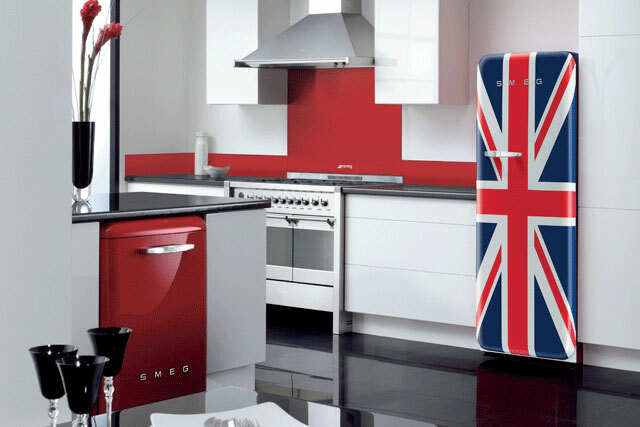 As well as fridges, Smeg manufactures 750 cooking, cooling, cleaning and heating appliances. It has also branched out into other areas, creating professional divisions that manufacture products for food-service customers, including commercial ovens and dishwashers designed for restaurants and hotels, plus instruments for health and medical applications. The company remains a family affair, run by the third generation (since 1948) of the Bertazzoni family. It currently employs more than 1,850 people in its operations around the world. An Italian brand that many of us assume is Scandinavian, which took off with fridges evoking a sense of retro Americana. If the design is good enough, we are happy to be a bit fuzzy on the details of provenance. It's pretty simple isn't it? The "classic" FAB Smeg became the fridge to buy because the design had emotional appeal; their generous curves (backed up with robust engineering) perhaps made it appeal to the women making the in-store purchase decisions. Once one has seen a Smeg, it is hard to go back to a boring cube designed along more patriarchal lines. And they came in many colours beyond white because, well, why be so boring? The FAB caught the imagination of a generation who wanted to trade up to something bigger and chunkier than was typical in the 1990s. The FAB design was bigger, better, cooler. "Why settle for less?" they seemed to ask. In class-conscious Britain, they came to stand for "smug" as much as anything. You will notice I am not dwelling on the brand's wider range – my instinct is that we Brits only trust a brand to have one signature product with personality. Too many funky lines would stretch our sense of credibility. But what a product the FAB is. Before it arrived, one would have struggled to name a "nice fridge". No longer. 1948: Smalterie Metallurgiche Emiliane Guastalla (Smeg) was established as an enamelling works. 1956: The first Smeg cooker, the Elisabeth, was launched. 1963: The Leda front-loader washing machine was introduced. 1970s: The company branched out into hobs and ovens. 1996: It introduced the FAB fridge. 2003: Architect Guido Canali designed Smeg's modernist headquarters in Guastalla. 2005: A retro-style FAB dishwasher launched. 2007: The Guastalla HQ won the Modena Domotics Competition for sustainability. 2009: Designer Marc Newson's oven and hob range won the Wallpaper* Best Domestic Appliance award. 2010: Newson's range picked up more awards from the Chicago Athenaeum Museum and the European Centre for Architecture Art Design and Urban Studies.